The Family Villa consists of two en-suite bedrooms and is able to accommodate families or two couples. A magnificent open-plan kitchen and lounge area opens to a spacious deck overlooking the Machangulo forest, Inhaca island and the open Indian Ocean. The Family Villa can sleep a maximum of four adults and two children. The Lodge overlooks this magic; endless white beaches, pristine and untouched dune forests, estuaries bursting with life and eternally wide open ocean – all in an energetic harmony. Hidden away amid the dunes and hiding amongst the forests, Machangulo Beach Lodge has a warm and inviting atmosphere, keeping its guests calmly protected from the epic nature outside. 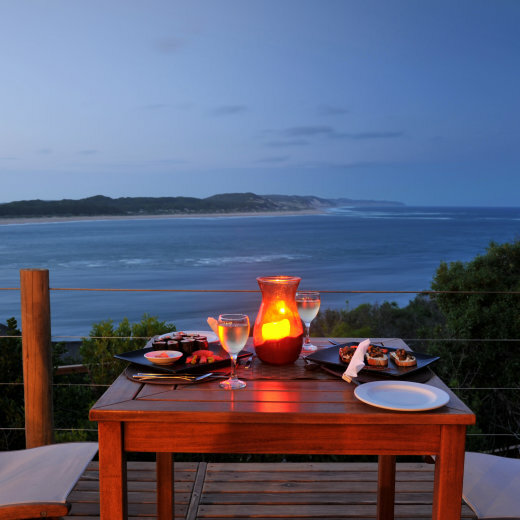 Machangulo Beach Lodge features 14 private luxury chalets. Each chalet has an on-suite bathroom, air-conditioning, mosquito nets and private deck. Five chalets have a breathtaking view of the ocean and Inhaca Island, and the others are grouped into Villas. Please see our Villas page for more information. All the chalets are connected by walkways and staircases to the main buildings and the beach.